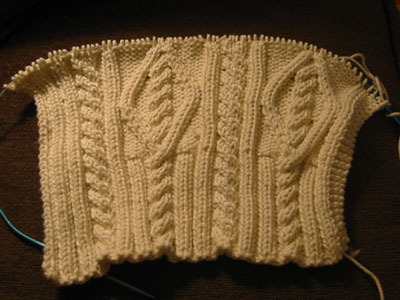 by Debbie Bliss, but as I mentioned in this entry the yarn was prohibitively expensive. Johanna, a fellow KnitSmith, tipped me off to a woman who frequently sells Debbie Bliss DK Cotton on Ebay, so I started watching it like a hawk. Sure enough, there was quite a bit of DK Cotton up for bidding, but for weeks and weeks it seemed like every color except cream. Finally, there it was. I waited to bid until the very last minute and I won -- netting $120 worth of yarn for $42, with a $12 shipping charge to get the goodies from the UK to my greedy little hands. I was a good girl and waited until the pinky sweater was finished before casting on. I'm glad that I held out for the right yarn. With the onset of chilly weather suddenly upon us here in the Bay State, I'd better get knitting! Woo hoo! Looks awesome. Can't wait to see it really grow. And good job being patient and waiting for the yarn at a good price. What a deal!